1. Snowbird Barrier Free Trail: This trail is located directly behind the Snowbird. After you maneuver your way through the building and up the elevator you will find yourselves walking along a beautiful flat trail for 1/2 mile to the end. We saw lots of wildlife and there are interpretive signs along the way. It is a very beautiful shady trail. 2. Temple Quarry Trail: This trail is very short (only 1/4 mile) with a few signs about the historical significance of quarrying rock for the LDS Salt Lake Temple. We love visiting this one in the fall. 3. 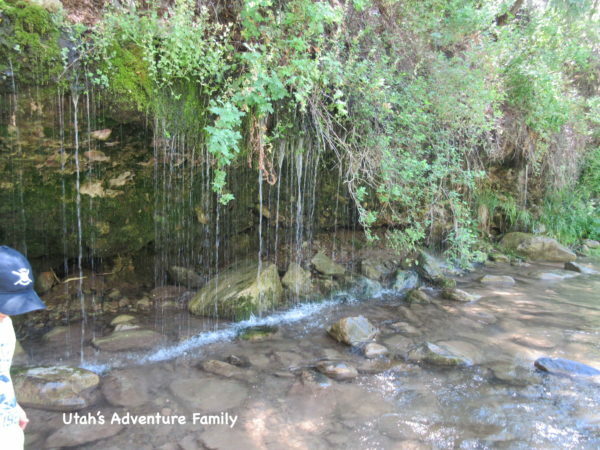 Dripping Rock Trail: This is one of our favorite trails. As you follow the river you hear dripping water and will see it dripping out of overhanging ledges. We walked down to the riverbank for a closer look (which you can’t do with a stroller), but it is still a great view from the trail. This one is perfect for a hot day! 4. 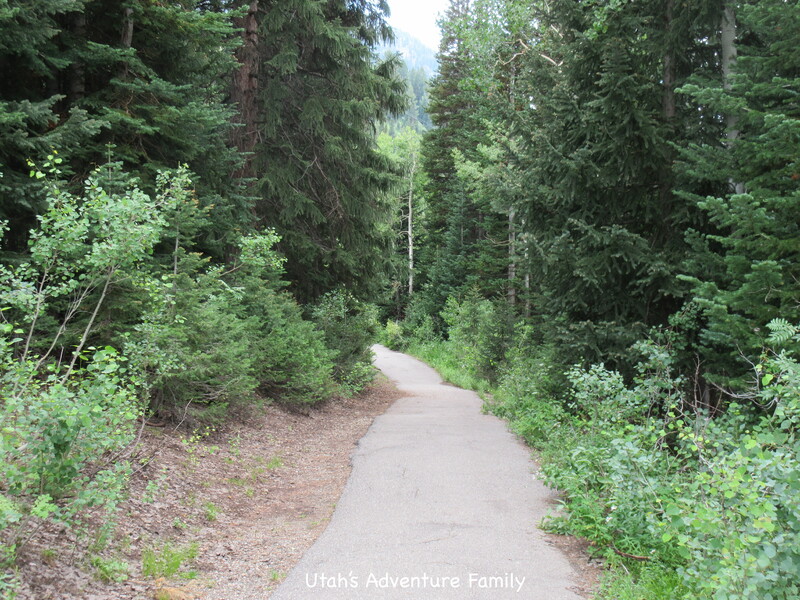 American Fork Canyon Nature Trail: This trail is FREE even though it’s located in American Fork Canyon. 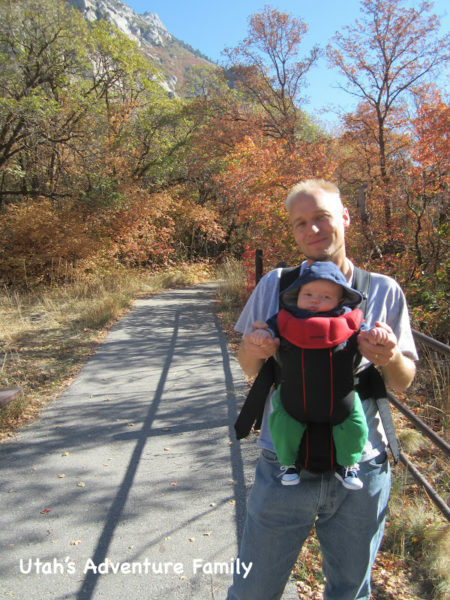 It is part of the Timp Cave National Monument land, so tell them the hike you are doing to enter without paying. 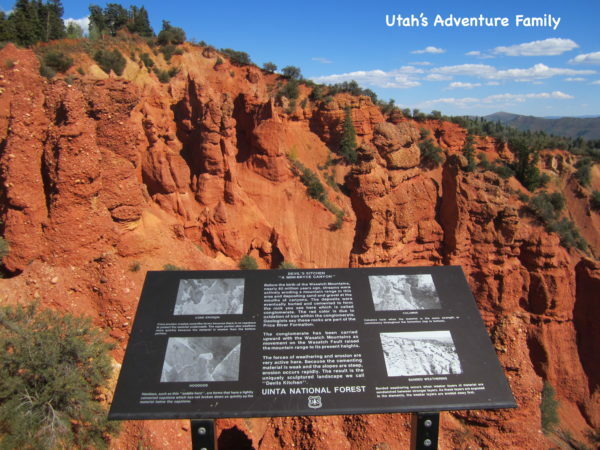 If you plan to use other parts of the canyon, you will need to pay the fee. This trail has a pamphlet with info for each number your arrive at along the trail, so pick one up at the start of this nature trail. 5. 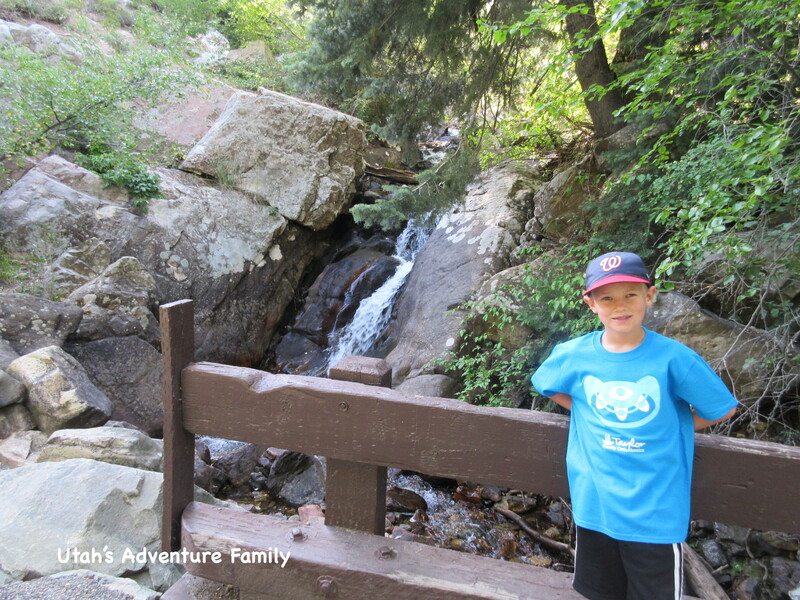 Cascade Springs: This trail is also in American Fork Canyon, so you’ll have to pay the fee for this one. This trail has boardwalks, paved paths, and bridges, and you can walk next to some beautiful ponds and a waterfall. Cascade Springs is a bunch of loops so you can walk as short or long as you want. We love reading the signs. 6. 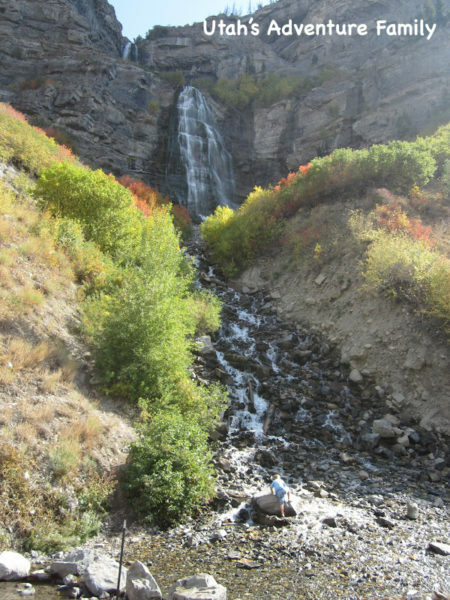 Bridal Veil Falls: Most people know about this beautiful waterfall in Provo Canyon. This is an easy stroll on a paved trail over to gorgeous Bridal Veil Falls. That’s our 6 year-old climbing on the rock. 7. Silver Lake: We love this beautiful Alpine Lake. 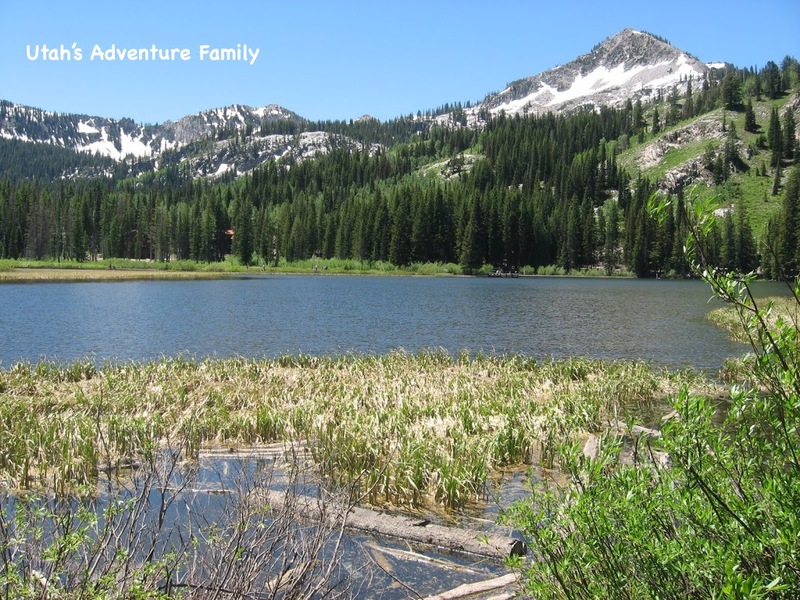 Silver Lake is located at the top of Big Cottonwood Canyon. There are boardwalks near the lake, but to circle the whole lake you have to push the stroller on dirt trails. We have done this, but it gets a little bumpy. You can still walk most of the lake on the boardwalks. 8. 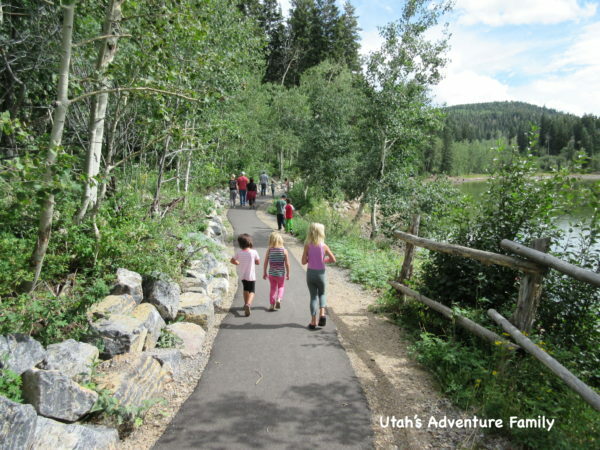 The “U” Hike: Letter Hikes are fun for kids. They love seeing those letters on the mountains up close. 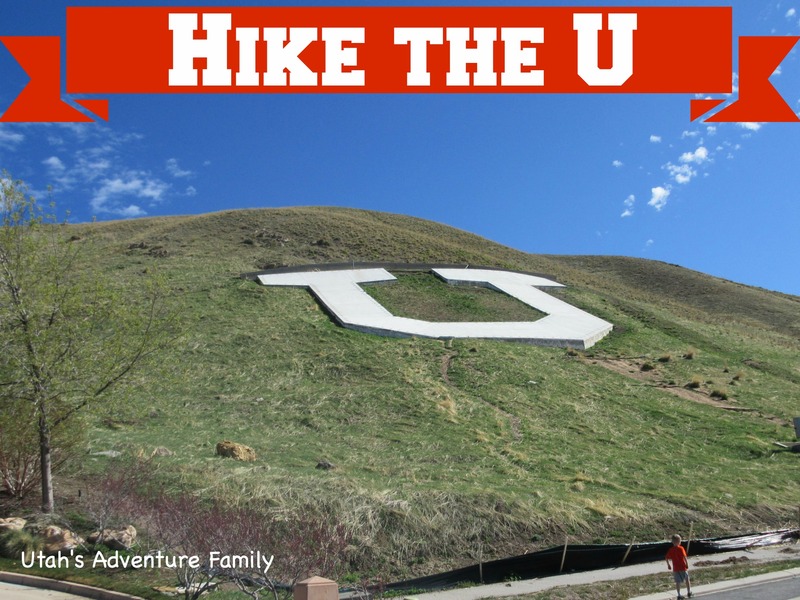 The U for the University of Utah is located in a neighborhood and has a paved trail the entire way to this famous Utah letter. 9. Devil’s Kitchen: This is a very short walk…maybe a block, but it’s a paved trail on the Nebo Loop. The drive on the Nebo Loop is gorgeous, so it makes this short trail worth it. Devil’s Kitchen looks like a piece of southern Utah right at the top of a mountain which is slightly surprising. It’s like a mini Bryce Canyon. 10. 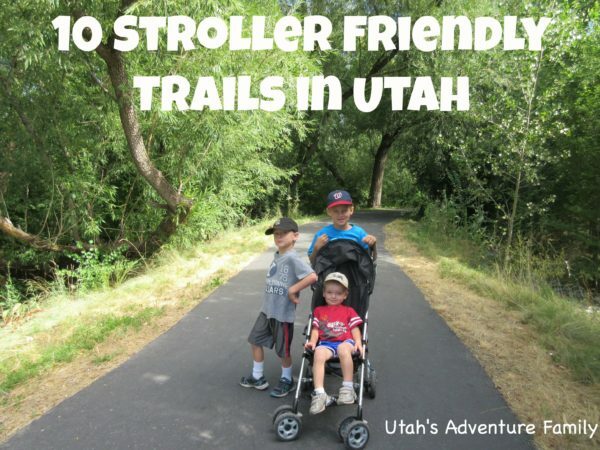 Mill B South Interpretive Trail: This trail is a little steep, but you can push the stroller as long as you’re ready for a little calf workout. 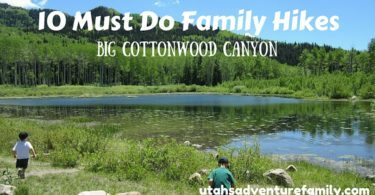 The great part is it’s only .3 miles to a fun waterfall and you walk along the beautiful river in Big Cottonwood Canyon the entire time. 11. 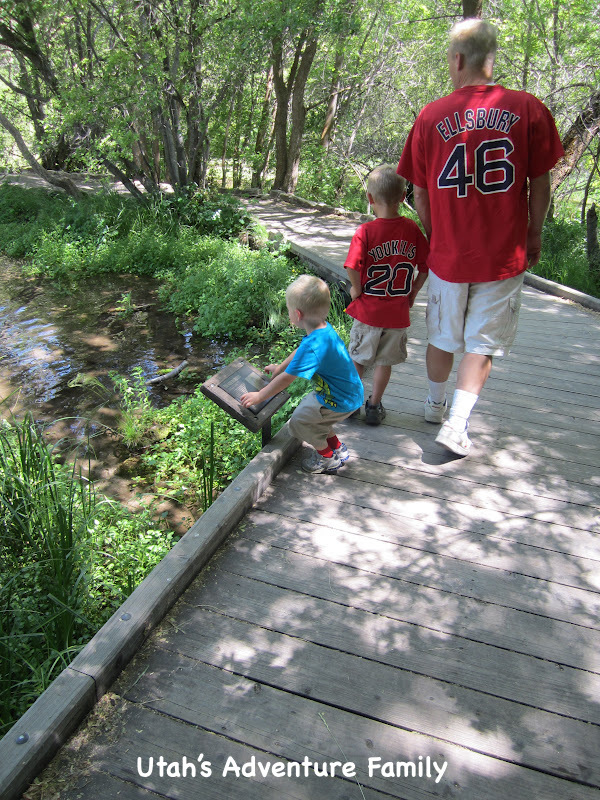 Payson Lakes: The trail around Payson Lakes is beautiful all year round. It’s very flat and about 1 mile around the lake. There are so many picturesque spots along the way, make sure to bring your camera. 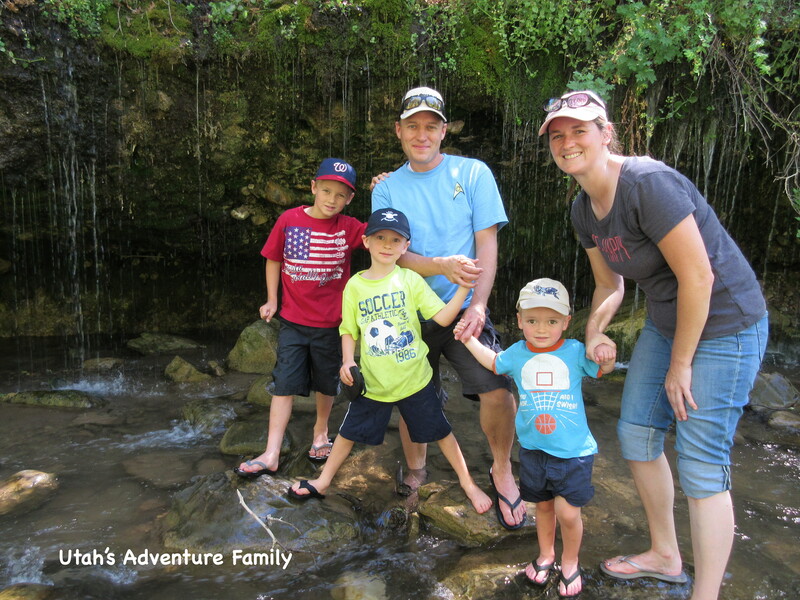 There is a fee for entering the Payson Lakes area, but there is also lots to do here such as fish, hike, swim, throw rocks, and picnic! 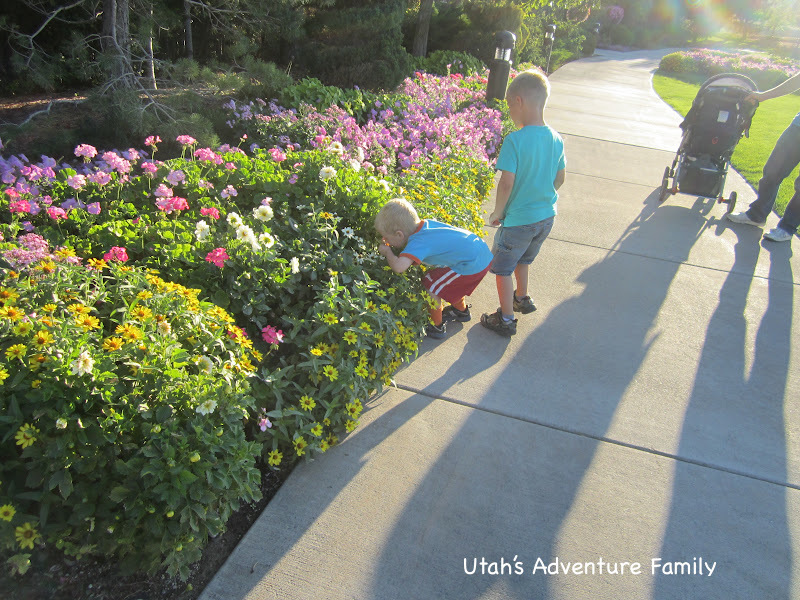 Thanksgiving Point Garden requires an entrance fee, but go during the Tulip Festival for millions of tulips or during August on $2 Tuesdays. Even in September the flowers have quite an aroma. Lots of paved trails through the gardens. You can walk for a long time. 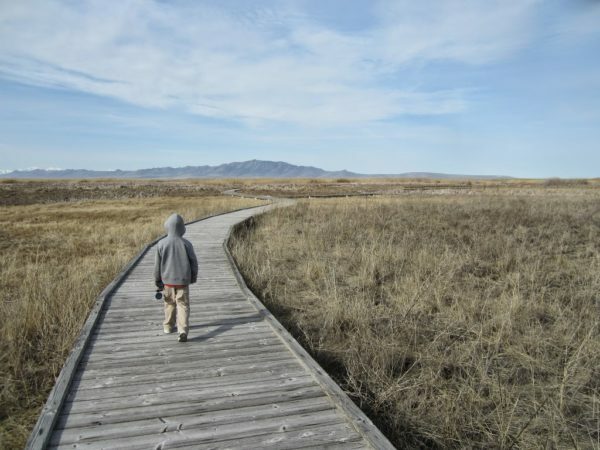 Great Salt Lake Shorelands Preserve is a one mile loop on a boardwalk through a marshy preserve with lots of spots for seeing birds. Two more to add to your list that you might like, if you haven’t already tried them, are the Lagoon trail and the trail that begins at Farmington Pond and leads to the Lagoon trail. Both are beautiful and stroller/bike friendly. On the Lagoon trail, you walk along the back side of Lagoon and can see the water ride and the animals that you see when you ride the train. Thanks for mentioning this! 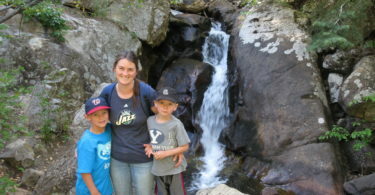 We have done the Lagoon Trail (https://utahsadventurefamily.com/lagoon-trail/), but we haven’t down the Farmington Pond Trail. We will try to get to it soon! This was definitely heaven sent. I have both a nfather in a stroller and my father in a wheelchair. We’re always looking for something the whole family can participate in. Thank you.